Toyota's full-size Tundra pickup is every bit as big as the top-selling trucks from GM and Ford. The Tundra is offered in a wide range of models covering three cab styles, three bed lengths, three powertrains, 2WD and 4WD. The base engine for the range is a 4.0l V6 engine rated at 270-bhp. Two V8 engines are available, a 4.6l V8 and a brawny 5.7l V8. Cab styles include the regular cab with one row of seating, and the two-row Double Cab and CrewMax styles. The Double Cab has four traditionally mounted doors. The larger CrewMax 4-door has a spacious back seat area. 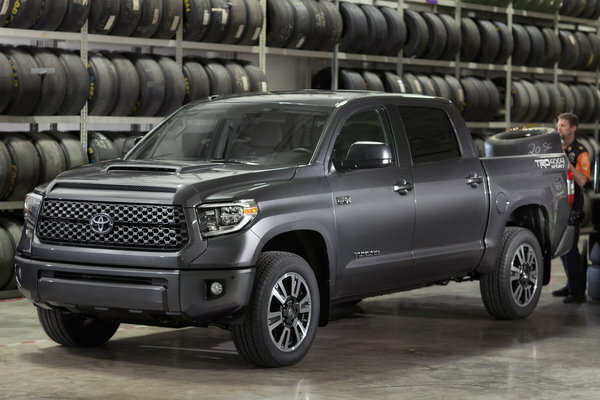 The Tundra range begins with the SR base grade. Buyers can opt to equip the base truck with a Work Truck package with vinyl seats and rubber floors. The SR5 package adds basic power equipment, cloth seats and carpet. Some Tundra models are also available in the Limited grade with leather seats and additional equipment. A Tundra can tow up to 10,200 lbs. depending on the model and equipment.